Gabbar Sing -Super hit - Kevvu Keka - Movie Review | GSV Films :: Film news, video songs, movies news telugu, tamil hot actress. The most awaited movie by the fans and Telugu Audience world wide is released on this May 11 . Pawan Kalyan’s die-hard fans who started adoring him from Badri and Khushi are eagerly waiting for this release. ‘Gabbar Singh’ is the remake of Salman Khan starred Hindi Blockbuster “DABANGG”. Harish Shankar made some major changes and has given an entertainment angle to it. Most importantly there is no story at all, it's not meant to make sense. It's only meant to entertain. The only factor that worked here is Pawan Kalyan, Pawan Kalyan and Pawan Kalyan. 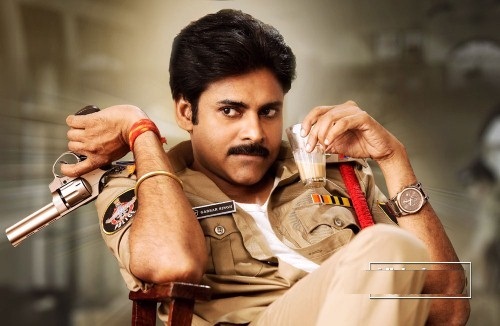 The characterization of Pawan is loud, crazy, zany, exaggerated, larger-than-life, and almost nonsensical but that’s how his fans want him to look like so it worked well. Pawan completely justified the role with his attitude and mannerisms. You haven’t seen him so charging and yet acting cool in many scenes in recent times. He has given wonderful performance which takes the movie to the next level. Sruthi Hassan is okay, she is passable. She played the role of Village girl and she is okay in terms of acting but some how the sarees/traditional wear didn’t suit her much. The chemistry between the lead pair has worked to some extent. Abhimanyu Singh(Raktha Charitra Fame) has done decent job as villain. Tanikella bharani and Kota Srinivasa Rao are okay. Rao Ramesh makes his presence felt as minister. Brahmanandam as recovery officer and Ali as Police constable entertain well. The artists in the villain gang entertained well in the Anthyakshari episode.